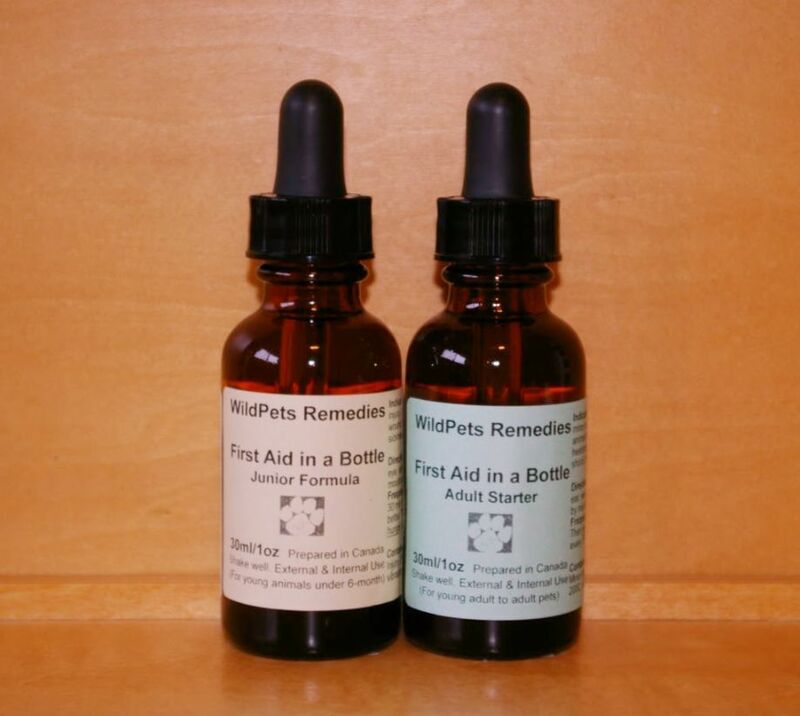 Do you know that most minor pet first aid situation can be easily addressed by holistic natural remedies? The key is to have it on hand while you need it so you do not go into panic mode when your dog, cat or other animal companion is in distress. Even for serious pet emergency, a good first aid remedy can slow the damages while you travel and wait for veterinarian care. Keep our multi-function WildPets First Aid in a Bottle on hand before accidents happen to your precious pet companion. For serious pet emergency, where veterinary care is not enough to assist recovery, order our Holistic Pet Wellness Consultation to address life-threatening symptoms in your canine, feline and animal friend. A 100% natural pet remedy for common pet first aid situations - cuts, abrasion, bleeding, bruising, eye/ear scratches, minor injury, bruised bone, hairline fractures, sprain, strain; insect stings, animal bites; wound inflammation, swelling, infection; burn, scald; heatstroke; motion sickness; tummy upset; traumatic shock, dehydration and laboured breathing. This homeopathic, vibrational essences and energy blend is antiseptic, versatile and can help your dog, cat and pet with minor first aid cases and serious emergency situations while you wait for veterinarian care. This remedy is also designed for dual use - externally for wounds in the skin, eyes, ears, mouth AND internally for non-injury type first aid (e.g. food poisoning). There are no toxic, dangerous or over-powering chemicals in this pet first aid bottle. No artificial colors, fragrances or preservatives, and contains no aromatherapy essential oils, making it safe for cats, puppies, kittens, smaller pets and those with a weak or small liver. This pet first aid remedy is exceptionally well-designed from years of experience 'in the trenches' with animals and their scary moments. Our first aid in a bottle will take care of most acute first aid situations you will encounter with your beloved feline, canine and animal friend. Perfect for your pet's first aid kit during walking, hiking, camping and traveling trips. Don't forget to keep one bottle in the house, car and cabin! This remedy is designed for both internal and external use, and is safe for ingestion. Ingredients: Proprietary preparation of homeopathic blends Minor Injury, Sting & Bite, Tummy Ache, Emerg 1st Aid; and vibrational essences blend in arg-c 10ppm solution. Suitable for dog, puppy, cat, kitten, horse, pig, farm, wild, zoo and all canine, feline, equine and pet animals. How does this home healing remedy treatment going to help your dogs, cats or pets? relieves pet allergic reaction to plants such as nettle, poison oak, etc. Potency Selection for Home Treatment: Use our "Junior Formula" for young animals under 6 months old and "Adult Starter" for young adult to adult pets (6 months & older). Clinical-strength high potencies are available upon consultation and custom healing only - to ensure suitability and safe application. For severe, complex, multi-layered or chronic illness, please use our 1-on-1 pet healing consultation and services to ensure correct health assessment and proper matching healing solutions. Dual use Use externally for wounds or internally for non-injury first aid situation (e.g. heat stroke). Note: Response to remedies and supplements varies by individuals and individual cases. If these products do not give complete healing, your pet may need one-on-one wholistic attention through our holistic consultation or consultation with a veterinarian.